Who remembers Georgia Championship Wrestling? 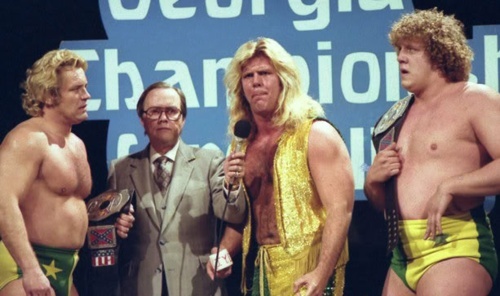 Wrestling fanatics out there should be unrelenting in the pursuit of what really happens/happened in the world of wrestling, and that includes knowing about the history of Georgia Championship Wrestling, even though defunct at the moment, has had a huge impact on today’s world of wrestling. We talked about history Memphis Wrestling in the last article which all started in the 1940s but while it was trying to get deeply rooted in that era, a company based in Atlanta managed a professional promotion which was aired in the 1970s and 1980s in Atlanta, US, Superstation, WTBS and it was called Georgia Championship Wrestling mainly because live wrestling shows were organized in Georgia. Georgia Wrestling Championship (GCW) was formed by promoter Paul Jones who showed GCW to the world for the first time on the Christmas day of the year 1971 and by 1972 it started promoting matches at the Omni Coliseum. It switched its television outlet from its original home WQXI TV (now WXIA) to an upstart UHF station, WTBS. Quite similar to any startup, GCW also encountered challenges which the formation of the All-South Wrestling Alliance formed by Ann Gunkel, wife of Ray Gunkel who was an assistant to Paul Jones contributed to. Ray Gunkel ran the promotion of the Georgia Championship Wrestling working closely with his wife Ann but died of a heart attack after a match versus Ox Baker. His death brought up issues that ensued after his widow was denied his shares of the promotion hence the decision to start her promotion outside the NWA which called All-South Wrestling Alliance. The eventual repercussions were the splitting of the Mid-southern wrestlers, and this went on for two years until Jim Barnett emerged. Jim owned World Wrestling Championship, and it wasn’t long before Ann’s promotion was locked out of Arena gates and wrestlers began to defect to the mid-south, leading to the folding of the All-South Wrestling Alliance in the year 1974. Becoming World Championship Wrestling was very notable for GCW and paved the way for the era that surprised many, a crucial factor in Vince’s drive for National superiority when he bought it in 1984. Vince MaMaphon was the regional promoter after Barnett was forced out in a power struggle in 1983 and thus became the name that signifies the day the Georgia Championship Wrestling ceased to exist. This was after he bought the promotion and its TV time slot for his nationally expanding WWF, precisely on the 14th of July, 1984. That day was termed Black Saturday by all who can remember the takeover. GCW became part of WWF but posed challenges for the Mcmahon because WWF’s style of wrestling greatly differed from the Georgia Championship Wrestling, with WWF featuring cartoonish characters and storylines and GCW featuring more athletic competitions. Not to mention the resentment from Southerners for taking over their Wrestling. By 1985, WWF changed names of their program to WWF Georgia Championship Wrestling and began airing in studio squash matches. However, GCW didn’t completely phase out after the Black Saturday because the likes of Ole Anderson wasn’t about to give it up without a fight as he tried to promote GCW. On April 1985, the show began co-promoting with Jim Crockett promotions until 1986 when it all fizzled out. So, who remembers Georgia Championship Wrestling?